Combine visitas al Pacific Historic Park, Punchbowl y el centro de Honolulu en este recorrido de lujo de 9.5 horas. 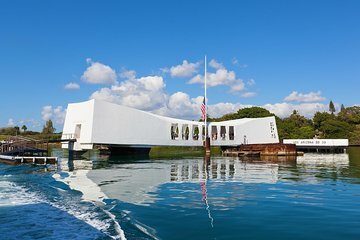 Visite todos los sitios históricos importantes, incluidos el Pacific Aviation Museum, el USS Battleship Missouri, el USS Bowfin y el USS Arizona Memorial, con boletos sin colas y horarios reservados de traslados y películas. Almuerzo y transporte de ida y vuelta al hotel incluido. Almuerzo en la cafetería del Pacific Aviation Museum. Transporte de ida y vuelta desde los hoteles de Honolulu y Waikiki. If you're a history buff this is the tour for you! You start the day driving up to Punchbowl to the war memorial there which is a beautiful site. Then you're off to Pearl Harbor to spend the rest of your day. Due to the security at Pearl Harbor they do not allow bags through the visitors center or Ford Island so avoid bringing one if you can! Unfortunately for us it was too windy that day so were unable to dock at the Arizona Memorial which was quite disappointing as it is the main attraction at the Visitors Center, so just be mindful of the weather when you book this tour. The visitors center had plenty to see and the U.S.S Bowfin was awesome to walk through. The aviation museum on Ford Island was really interesting and had lots of restored aircraft's through the ages. Our favorite stop was the Battleship Missouri as it is nothing like we've ever seen before. We didn't do the walking tour and just explored on our own but there is a lot to see in such a short time so just be wary of that when walking through. All in all it was an awesome tour and I would highly recommend it! The tour was very well organized and thorough. The description was spot on. Unfortunately we were not able to get off the boat and onto the Arizona museum itself and had to settle for looking at it from afar, due to wind conditions. That was a big disappointment, but not the vault of the tour itself. This was great and well organized tour and one not to be missed. Our guide Fred was very knowledgeable and able to answer all our questions. Besides the organized part we also had time to walk around the memorial and air museum on our own I really liked that part. The lunch was good also. Again great tour but it was a long day, but worth it!